The Enugu State Governor Rt. Hon. Ifeanyi Ugwuanyi popularly called “Gburugburu” by his people, assumed office in the “Coal City State” with an assurance that he would work hard to entrench peace and good governance in spite of the country’s daunting economic challenges. But he has even moved beyond his state. He has in his own unique way promoted unity with every other state governor in the country. For keeping to his words, for engendering industrial harmony, innovative and creative internal revenue generation processes, massive infrastructural development as well as enhancing security in the state, Hon. Laurence Ifeanyi Ugwuanyi is LEADERSHIP Governor of the Year 2018. Governor Ugwuanyi did not leave the state-of-the-art Enugu State Diagnostic Centre behind as he made sure that the facility, which is the first of its kind in the south-east, established to create hospital chains that will make Enugu a safe haven for high-quality and affordable healthcare delivery in the country, received massive attention.In the area of security, Ugwuanyi has scored a high mark. Many believe that the peaceful atmosphere existing in the state is partly due to the positive way he relates with security operatives. 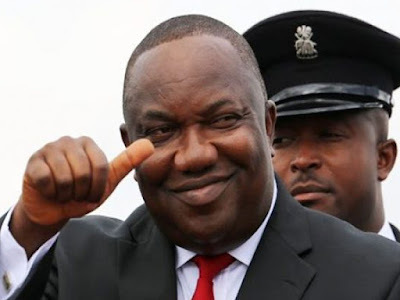 Little wonder the chairman of the Police Service Commission (PSC), Alhaji Musiliu Smith, recently stated that Governor Ifeanyi Ugwuanyi of Enugu State deserves credit for running the state in a progressive, people-oriented and security-conscious manner.